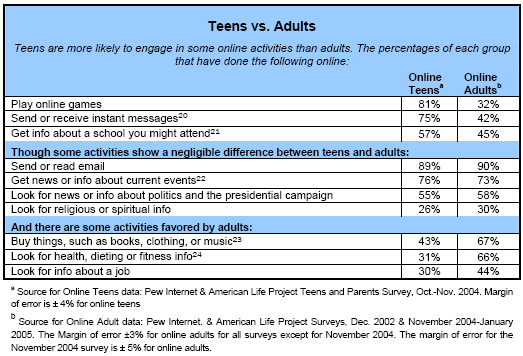 The nature of teens’ online activities changes with age and access. In the same way that age matters when looking at patterns of internet use among different generations of adults, teens continue to demonstrate different phases of internet use as they grow older and new technologies become available to them. Some of these changes in behavior are visible in age-specific trends in various internet activities that have been consistent over time. For instance, though the gap has narrowed since 2000, younger teens (aged 12-14) continue to be more interested in online gaming than older teens (aged 15-17). Similarly, it is as true now as it was four years ago that older teens lead the pack for instant messaging, online news gathering and online shopping. However, other changes in internet activity levels over time can be attributed, in part, to the evolution of the technology that is accessible to the teen of today. At the most basic level, we have found that the connection speed a teen has access to affects his or her likelihood to engage in certain activities. Beyond that, there are a host of other factors that can influence the landscape of activities that teens engage in on a typical day. As was discussed earlier in the report, the type of “technological environment” that surrounds a teen shapes his or her online life. The discussion of online activities in this section of the report is generally limited to the genres of information-seeking and leisure activities. For the purposes of this report, we have excluded all of the questions that relate to creating, sharing and downloading content online. These activities will be included in a forthcoming report from the Project. Growing numbers of teens shop and play online. Online shopping, gaming, news seeking and health searches have all become considerably more popular among teens since we last surveyed them in the fall of 2000. The percentage of online teens who buy products online has grown 39% since our last survey, while the proportion of online gamers jumped 23%. In contrast, some of the tried-and-true online pastimes for teens, such as email, instant messaging and entertainment website searching remain unchanged. Teens of all ages are now more likely to make online purchases. Older teens, who may be more likely than younger teens to have credit cards, are better positioned to be online consumers.28 About half of online teens aged 15-17 (52%) have purchased something online compared to a third (33%) of those aged 12-14. In 2000, just 36% of 15- to 17-year-olds and 26% of 12- to 14-year-olds had made online purchases. On the whole, online girls and boys are equally as likely to have made a purchase on the internet. Yet, most of the growth that we have observed in recent years has stemmed from the increased shopping activity of online girls aged 15-17; 34% of online girls in this age group had bought something online in 2000, compared to 51% who reported this in 2004. Conversely, online boys aged 12-14 have exhibited the least growth; 29% of this age group had tried online shopping in 2000 while 34% reported this in our most recent survey. Our research on adults has repeatedly found that having high-speed access at home translates into a greater likelihood that one will make purchases online. Our latest data reveal a similar trend among teens; 52% of teens with broadband connections at home make purchases online compared to 39% of those with dial-up. Teens are just as likely as adults to get news and information about current events online. Girls and boys are equally as likely to be online news-seekers. 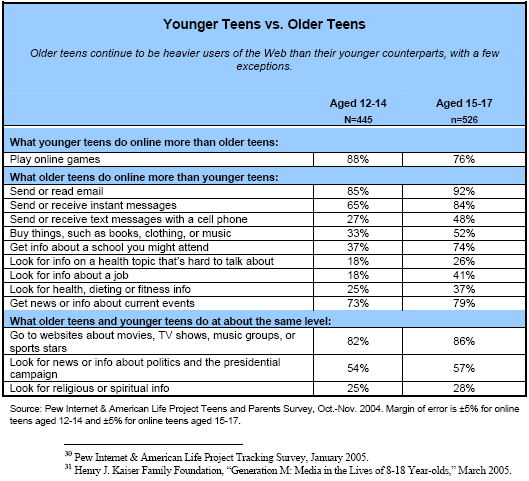 Yet, older teens (aged 15-17) are somewhat more connected to online news than younger teens (aged 12-14); 79% of older teens seek news online while 73% report this. 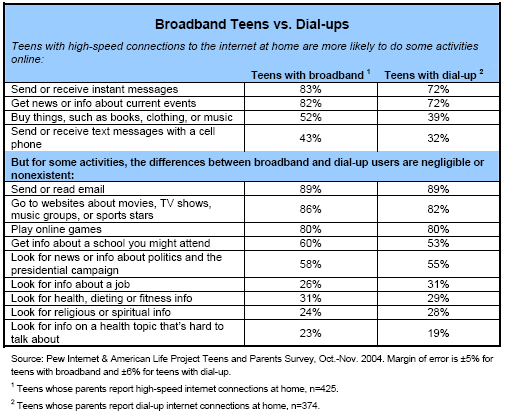 As is the case with adults, teens who have high-speed connections at home seek online news in greater numbers than those with dial-up; 82% of broadband teens use the internet to get news, while 72% of dial-up teens do so. More than half of teens report political news-seeking. The gender gap that exists in political information-seeking for adults does not appear to resonate with teens. While boys and girls are equally as likely to seek news about politics and the presidential campaign online, adult men have consistently reported higher levels of engagement with this activity. Entertainment information continues to rank highly among teens’ online pastimes. Using the internet to access pop culture and entertainment information has consistently been one of the most widely cited activities teens engage in online. Aside from email use and online games, there are few online pastimes that rank as highly in the average teen’s playbook. In all, 84% of online teens have visited websites about movies, TV shows, music groups or sports stars they are interested in. This figure remains essentially the same as it was in 2000, when 83% of teens reported visiting entertainment websites. Online girls are slightly more likely than online boys to visit entertainment websites (88% vs. 81%). Specifically, girls between the ages of 15 and 17 lead the pack: 90% say they go to these sites, compared to 82% of boys in this age range. Teens are more than twice as likely as adults to play online games. Online games, which may be used for both entertainment and educational purposes, play a role in most teens’ lives. While just one-third of adult internet users play online games, more than twice as many online teens (81%) report this. That translates into more than two-thirds of the total teen population (aged 12-17) who play games on the internet. Teens with broadband at home and those with dial-up connections report exposure to online gaming in equal numbers. Though some of the more sophisticated multiplayer online games that are popular with teens demand fast internet connections, there are also many free games available online for which a dial-up connection is sufficient. Online gaming is especially prevalent among teens in the 12-14 age range; 88% in this group report gaming while 76% of those aged 15-17 report this activity. And while there are no significant gender differences among adult internet users who play online games, more online boys (86%) report internet gaming than online girls (76%). Most online teens will turn to the internet when searching for schools. Fully 57% of online teenagers say they have gone online to get information about a college, university, or other school they are thinking about attending. The likelihood that an online teen has used the internet to search for college or other schools goes up with age: 27% of the 12-year-old internet users have done this, compared to 85% of the 17-year-olds (generally high school juniors or seniors). Girls lead the way in using the internet to hunt for colleges and other schools. More than two-thirds (61%) of all the online girls aged 12-17 have used the internet to get information about schools, compared to 53% of boys. Older teenage girls are the most likely to do this: 79% of the online girls aged 15-17 say they have gotten information about schools, compared to 70% of the boys in that age cohort. Interestingly, there is no significant difference between the proportion of teens with broadband and those with dial-up access who gather research about schools on the internet. Just over half (53%) of teens who have slower internet connections at home report seeking information about furthering their education and 60% of those with high-speed connections at home report this. In a separate survey of adults in January, 45% reported going online to get information about a college, university, or other school they are thinking about attending or which other members of their family are examining. In both the survey of teens and the survey of adults, it was the first time that the Pew Internet & American Life Project asked this question in its ongoing tracking of internet use. Contrary to what we find with teens, there is no notable gender difference for online adults who investigate schools. Another departure from teen trends, prospective school searching is more popular among the broadband cohort of adult internet users than it is with dial-ups. Naturally, young adults, who are more likely to be in school themselves, are more engaged in online school hunting than older adults. Fewer than one in three online teens have used the internet to look for a job. Just 30% of all online teens have looked for a job on the internet. That compares to 44% of all online adults who seek job information on the web.32 However, not surprisingly, teens’ online job searching varies greatly according to age. While 18% of online teens aged 12-14 will use the internet to search for employment information, 41% of those aged 15-17 will take their job hunt online. Research by the Kaiser Family Foundation suggests that a mere 16% of American youth hold jobs.33 Boys and girls are equally likely to use the internet to search for jobs, a trend that’s consistent with the adult population for this activity. Teens’ online health-seeking grows. Older girls are also the most likely to research a difficult health topic. 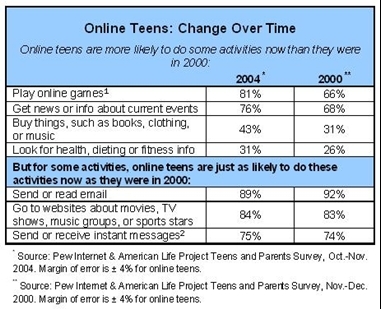 Teens who use the internet are now more likely to seek out health, dieting or physical fitness information online than they were in 2000. Three in ten (31%) online teens say they will look for this type of health information, compared to 26% who reported this in our last survey. Online girls aged 15-17 are almost twice as likely as those aged 12-14 to look for health, dieting or physical fitness content; 47% of older girls seek this information while 25% of younger girls report this. Older girls are also much more likely than either age group of boys to research health online; just 25% of boys aged 12-14 and 27% of those aged 15-17 say they turn to the internet as a health information resource. This trend is consistent with our 2000 data. Older girls are also the most likely to research a difficult health topic. For the first time, we asked teens if they ever look for information online about a health topic that’s hard to talk about, like drug use, sexual health, or depression. Just over one in five (22%) said they will use the internet to research a difficult health topic like this. As is the case with general health information, older girls aged 15-17 are much more likely than any other group to seek out sensitive health information online. Fully 34% of older girls will search for this information compared to 18% of boys in the same age group. Just 19% of online girls and 18% of online boys aged 12-14 will research difficult health topics. Teens’ interest in religious and spiritual information rivals that of adults. Our latest survey was also the first time we asked teens about using the internet to find religious and spiritual material. In all, 26% of teens who use the internet say they will look for religious or spiritual information online. That compares to 30% of adult internet users who reported this in a November 2004 survey. Once again, older girls drive the trend; 34% of online girls aged 15-17 seek religious and spiritual information compared to 23% of boys in that age group. 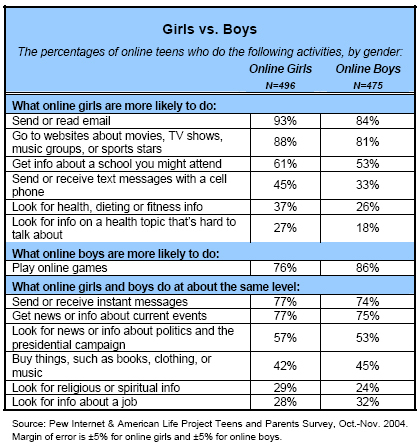 Similarly, 24% of online girls and 25% of online boys aged 12-14 will research difficult health topics.